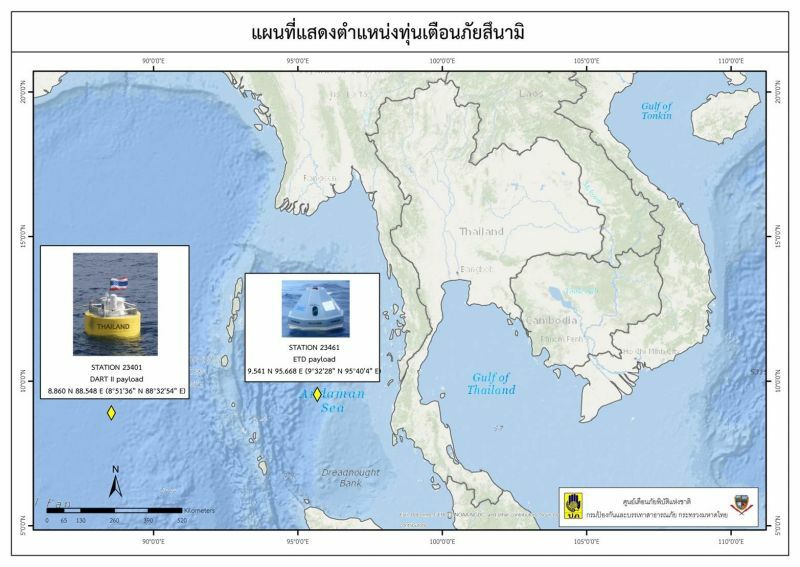 PHUKET: The National Disaster Warning Centre (NDWC) in Bangkok has confirmed to The Phuket News that the tsunami-warning buoy located nearest to Phuket island has not been functional for the past six months, but that it is to be replaced next month. 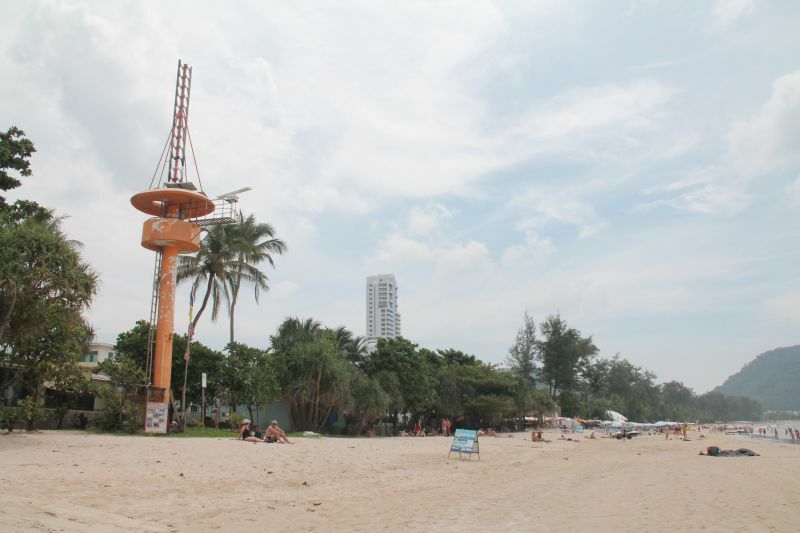 Meanwhile, the Department of Disaster Prevention and Mitigation Phuket office (DDPM-Phuket) has confirmed that all of Phuket’s 19 warning towers are functioning but that same have slight faults. Following last last Friday’s devastating Indonesian quake-tsunami on the island of Sulawesi, the country’s national disaster agency spokesman Sutopo Purwo Nugroho said that a tsunami-warning system, which might have saved lives, had not worked for six years due to a lack of money. 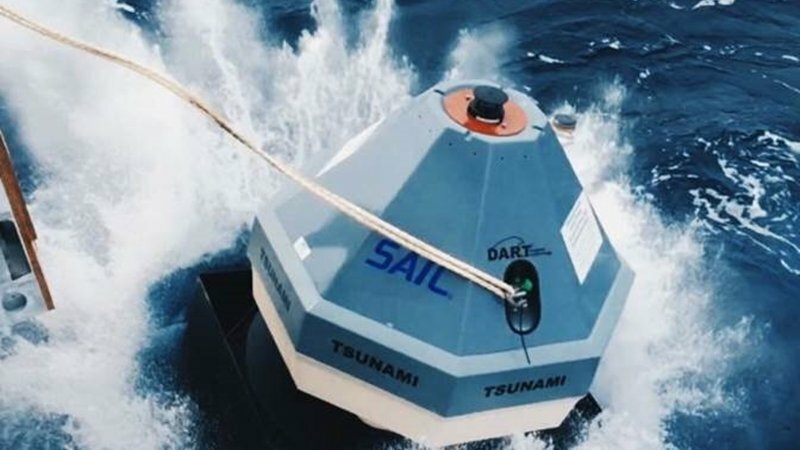 Speaking to The Phuket News yesterday (Oct 3), Director of the NDWC in Bangkok Suppapimit Paorik said, “I can confirm that the new tsunami-warning buoy which was deployed off Phuket in October 2017 (See story here) has been inactive for the past six months. We believe that the buoy has been damaged by fishing activities. “We have already ordered a new buoy which cost about B10 million. It will be set up in November,” he said. “There are two tsunami-warning buoys off Phuket, the nearest buoy (Station 23461) is 290 kilometres away (this is the damaged buoy), the second (Station 23401) is 960km away. “When the first buoy receives a Tsunami warning people have 45 minutes to evacuate. “When the second buoy receives the information people have 90 minutes to evacuate,” he added. Mr Suppapimit went on to explain, “If one buoy is inactive, we still have another to catch the warnings which will then send information to the warning towers. In addition, there is a Tsunami Warning and Mitigation System unit on Mein Island which feeds information to the Royal Thai Navy. “There is no need for people to panic. Should an incident arise please follow up the news via the DDPM website or call their hotline 1784,” he said. Meanwhile, when The Phuket News contacted Director of the DDPM-Phuket Prapan Kanprasang yesterday to inquire about the island’s 19 tsunami-warning towers, Mr Prapan first said that he was busy solving the flood and landslides in Kalama area. However, he did say, “We test all 19 towers around Phuket at 8am every Wednesday. These 19 towers not functioning 100%. For example, I found one tower in Kamala which did not broadcast loud enough”. According to Mr Prapan, a specialist from the DDPM in Bangkok will come to look intro the problems soon. However, most of towers are still functional and will work should a tsunami occur. Another media release states that the buoy has not worked since October last year, bit more than 6 months... more lies. According to foreign geological experts when they came after the 2004 Tsunami, the fault between North Sumatra and Myanmar (Burma) including Nicobar and Andaman Islands, did not break; so, it may do it in the future and in that case all the provinces along the Andaman Sea would get the full impact of the tsunami. In the 2004 Tsunami, Sumatra had more or less protected Thailand. Has anyone heard to warning sirens being "tested" every Wednesday, at 8am? Also, what actually triggers the system, is that also "tested," any "tech" can set off a siren, this does not mean the system works. They are an abject waste of time and money - just like life savers on the beach. If fools want to go the sea side to watch 6 metre high waves roll in that's their problem. Pretty much common sense if there is a earthquake anywhere in the world expect a tsunami. The warning systems should be top priority, some people have very short memories of what happened in 2004. This will not help increase tourism to Thailand at all if this warning system is not working at 100%. Why was the defect tsunami buoy 6 months ago not replaces by a spare/reserve buoy, and the broken buoy now already repaired stand by? Lousy criminal safety behavior. After 6 months not knowing why the buoy is defect. Just a lazy 'believing'. And all 19 warning towers not working 100%.! It is unbelievable what a chaotic lazy group of Government Officials are here at 'work'.